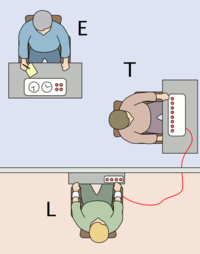 Milgram, Stanley (1963). “Behavioral Study of Obedience”. Journal of Abnormal and Social Psychology 67: 371–378. doi:10.1037/h0040525. PMID 14049516. http://content.apa.org/journals/abn/67/4/371. Full-text PDF.